For the fourth year in a row, I’m proud to present my annual “embarrassed on the Internet” baseball predictions. Last year you may recall that we picked the hated New York Yankees to beat the Atlanta Braves in the World Series. 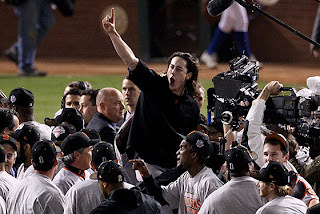 While I’m proud to have foreseen, Nostradamus-like, that both teams did indeed make the playoffs, I’m far more happy that I was dead wrong about the ultimate participants and the victor in said 2010 World Series. Why is that, you ask? It’s because My San Francisco Giants Are The World Champions of The World. I waited my whole life for the blessed event to occur, and to plagiarize Bill Simmons, “now I can die in peace”. This is why I can head into 2011 with a strut in my step, and with some confidence, at least predict an NL West repeat for the Giants. This year no one’s going to ask me what I’m smokin’. If someone does – well, I’m smokin’ on victory, my friends. This year, I ritualistically bought my Sporting News preview magazine, clicked on a few www. addresses with baseball blather, and tapped into my 34-year obsession with the game of Major League Baseball to come up with a new set of prognostications for the year. Now last year, though I got a few things right (5 of the 8 teams I picked to make the playoffs did indeed make the playoffs), there were a few proverbial curveballs that few pundits saw coming. The Texas Rangers, anyone? I think they’ll be weakened this year for sure, and will just barely hold off a resurgent, pitching-rich Oakland A’s for the keys to the AL West. My Texas Rangers this year will be the Milwaukee Brewers, who will run away with their division in a big bat-fueled and timely-pitching-defined laugher. Unfortunately for them, the Brewers meet a team in the NL playoffs that I think will also be soaring this year – the Atlanta Braves – a team whom I daresay will win the World Series in their first Bobby Coxless year. “Pray tell, Hedonist Jive, how can you say such things???”. The Braves – not the semi-overrated, already injured/damaged Phillies – will win it with pitching, just as the Giants did last year (and hopefully, my predictions notwithstanding, will again this year). Tommy Hanson, Jair Jurjjens, Tim Hudson, Derek Lowe - these guys are studs; the first two will have career years and catapult Atlanta to the division title over Philadelphia by maybe 1 game. no, scratch that, they'll have a 1-game playoff to see who wins the division and who gets the wild card. Over in the East, it’s the Boston Red Sox by a mile. I hope New York’s even worse than I think they’ll be (in my dream world, Derek Jeter hits .220 and retires mid-season, and A-Rod breaks another hip or something) – a third-place finish would make me happy; in fact, who knows, maybe those Baltimore Orioles will finally catch fire and finish out of the cellar. That’s what I’m predicting, anyway. I like both Minnesota and Chicago in the AL Central, so I’ll pick them both to make the playoffs, and then both vaingloriously lose at the hands of the mighty Red Sox. At the end of the day we’ve got my Giants falling back to earth a little bit, and a killer World Series between Atlanta and Boston. Boston loses in 7 games. Baseball stays classy. I get a flurry of emails on Halloween saying, “Hedonist Jive, how did you know this would all take place?”. I sit back and laugh. Enjoy opening day on Thursday March 31st, folks!